We’d love your help. Let us know what’s wrong with this preview of Station Rage by Diane Carey. What begins as a sticky political problem soon evolves into full-scale chaos for Commander Sisko when a tomb of Cardassian soldiers is discovered on Deep Space Nine. To ask other readers questions about Station Rage, please sign up. This was actually one of the first Diane Carey Star Trek novels that I was really liking for the first part. It had an interesting villain and a unique circumstance with how they handled DS9 and even Odo. However, about 2/3 of the way through it all falls apart and turns into a silly battle with literal pew-pew-pews... So unfortunately it did not live up to my expectations. Also, I didn't really care for how she wrote Garak. let's just say i don't read star trek novels for their fine literary qualities. extra star for semi-prominently featuring garak, my main man. Is this a GOOD book? No. Is this a book about CARDASSIAN ZOMBIES? Yes. Four enthusiastic stars. Classic DS9 from the early days - a nice plot with resurrected Cardassians sabotaging the station while other Cardassians assemble to deal with the loose ends said resurectees represent. This review has been hidden because it contains spoilers. To view it, click here. Good little action piece, well written but it doesn't really feel like DS9. The author hasn't really captured the characters that well. Sisko is cruel to his crew in ways he never was in the show, mostly he was rude towards Kira. Keeping Kira at arms length and creating a rift that was never there in the show. Further Sisko is written as some karate kicking, soldier action-man, when he isn't more than a strategist. Also the author fails to capture Garak's usual guile. Garak isn't the sort of chara Good little action piece, well written but it doesn't really feel like DS9. Also the author fails to capture Garak's usual guile. Garak isn't the sort of character to easily give into hero worship, and wouldn't aid in the destruction of the station as he did. Also, it's well established that characters cannot beam from station to planet, and doing so referenced twice. However there are some bright sides. The High Gul character is well written and interesting. And the back story about the construction of the station is fascinating. If I had to compare in many ways it reflects Balance of Terror, contrasting the pro- and ant- agonists. I just wish the author did state the resemblance between the grey dust and Cardassian skin so flatly. It's a nice little action piece but not worthy of any high praise. Read it or don't you're good either way. Station rage proves to be a highly charged action packed book that balances character development perfectly with suspense and drama. Although Diane Carey did a good job with recreating the characters she didn't quite catch the verbiage of those we know and love. I recently read Micheal Jan Friedman's Saratoga - and that book captured the characters personalities and verbal quips perfectly. Even though Diane Carey missed the characters a tad, she did a good job conveying who they are as people. Si Station rage proves to be a highly charged action packed book that balances character development perfectly with suspense and drama. Although Diane Carey did a good job with recreating the characters she didn't quite catch the verbiage of those we know and love. I recently read Micheal Jan Friedman's Saratoga - and that book captured the characters personalities and verbal quips perfectly. Even though Diane Carey missed the characters a tad, she did a good job conveying who they are as people. Sisko, painted as both a tough and thoughtful leader, is an intricate part to the story. His courage plays a key role to combating the villain, and his reasoning is one of many weapons in his arsenal. We all know him as a stoic, straight laced Starfleet Commander, but in the book Diane does a good job describing Sisko as someone who walks a fine line, willing to cross that line and take a dangerous risk to combat evil. Kira, by way of her history with the Cardassians, is also a focal point to the beginning of the story. Diane delves deep into her feelings as the events unfold and uses her knowledge to push the story along. Even though the Major doesn't play a heavy action role in the book she does show her command ability as Sisko runs around the station. Garak, probably the most profound character in both the DS9 series and within the whole franchise as well, plays a very important role in the book. 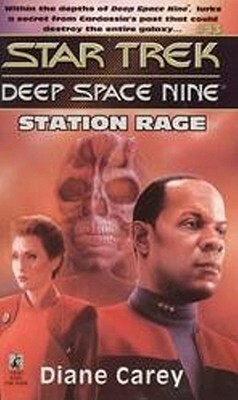 Although Diane doesn't take true advantage of the character by creating a deceptive and intertwined storyline, she does portray him as a go-between between Sisko and his adversary. Although the author didn't take full advantage of the characters strengths, especially Kira, the book offered so much that the lack of a Starfleet character driven plot line was made up by incredible action. The story surrounding the High Gul is very well done. For me this was a great read and I enjoyed it fully. With the main points of Space Seed in place Diane Carey twists until the story feels assiduously Deep Space 9 and what follows is a war of tactics between conquerors of the past and officers of the 24th century Federation & Bajoran Militia... of course even some of those dang Cardassians cross the border to get into action. If what the reader is looking for is an episode of the Star Trek series, this book gives out all the bang expected from the weekly syndicated sci-fi Space Seed, DS9 stylee! If what the reader is looking for is an episode of the Star Trek series, this book gives out all the bang expected from the weekly syndicated sci-fi series of the late 1990s. Though this particular yarn may have been better suited for Season One than taking place between "The Adversary" and "The Way of the Warrior" ...allllllso where the #^@% is The Chief?! Granted there was sabotage -but heck- Chief O'Brien is an old hand in the trenches and it almost doesn't seem quite right for O'Brien not to be on deck. That being said, Carey does a decent job with Station Rage. Unfortunately there were some issues: Such as confused, if not simply bad, scene transitions as well as dangling plot threads - both of which seemed to jostle the reader out of the story again and again. Deep inside the station is a tomb of Cardassian soldiers, ghosts from Cardassia's early empire who are just waiting to be awakened so that they might wage war against her foes. This is the effectively creepy setup for Station Rage, in which Garak loses his mind and Kira Nerys stops being The Major and is reduced to an anxious girl in uniform, smitten by the sheer awesomeness of The Sisko into watching him do battle like an action hero. Carey's writing is stilted here, and the handling of charact Deep inside the station is a tomb of Cardassian soldiers, ghosts from Cardassia's early empire who are just waiting to be awakened so that they might wage war against her foes. This is the effectively creepy setup for Station Rage, in which Garak loses his mind and Kira Nerys stops being The Major and is reduced to an anxious girl in uniform, smitten by the sheer awesomeness of The Sisko into watching him do battle like an action hero. Carey's writing is stilted here, and the handling of characters more than a little awkward. This is odd considering the fine job she did with the DS9 Dominion War novelizations. Holy Cardassian Mummies! Well, not actually, but close enough to be entertaining. While some of the details don't match up with what we know about Cardassia, Station Rage does a pretty good job creating an action packed story. I'm not 100% on the characterizations of Sisko and Kira, but the rest are pretty good. Garak isn't quite right either, but there's a nice scene with him and Bashir that made me happy although I'm not sold on the idea of Bashir not being suspicious of Garak. Overall, this is Holy Cardassian Mummies! Well, not actually, but close enough to be entertaining. While some of the details don't match up with what we know about Cardassia, Station Rage does a pretty good job creating an action packed story. I read this sometime in the last twenty years, but I was halfway thru before I remembered. Oh, the concept seemed familiar from page one but I kept thinking that I had started reading it and then had put it down. Then I got to the part where Odo was attacked in the lift... and, honestly I recalled all of Odo's suffering and nothing about the rest of the book. That was, of course, because that subplot was the best part of the book and the High Gul just got downright boring by then. A novel that manages to brilliantly capture the intensity of DS9 at its best...and the character of Sisko in particular. This is an intensity of plot and emotion you rarely find in the early DS9 novels, apart from "Fallen Heroes". This one is easily a milestone in the book series, and one of Diane Carey's best "Star Trek" contributions. I thought this was great - the best ST novel I have read in a long, long time. The characterisation was spot on and the story was one you could imagine happening on the series. It was full of action, surprises and a spookiness that I really liked. A very clever tale!! Not bad for a Star Trek novel. If this was an episode I feel that it would have a two parter. At times Kira and siskocharacterization felt kind of off. I felt at times Kira almost god worshipped sisko lol. I really liked this book. GREAT! Great fast read. One of the better books so far in the DS9 series. This review has been hidden because it contains spoilers. To view it, click here. Inconsistent characterization, plot threads left dangling and jumping from setting to setting with nothing to establish where we are and who were with. I just can't do these books anymore. A fascinating premise and a skilled author with a solid grip on the characters combine to make this one of the better DS9 novels so far. A good story. A cardassian tomb is hidden on DS9, things start to go wrong when its inhabitants wake up. A very good story with lots of unexpected plot twists. Diane Carey also wrote the Distress Call 911 young adult series under the name D.L. Carey. Diane Carey is primarily a science fiction author best known for her work in the Star Trek franchise. She has been the lead-off writer for two Star Trek spin-off book series: Star Trek The Next Generation with Star Trek: Ghost Ship, and the novelization of the Star Trek: Enterprise pilot, Broken Bow. For more Diane Carey also wrote the Distress Call 911 young adult series under the name D.L. Carey.